Keeping it casual is important when you are running a casual restaurant. If you want your customers to feel at ease, then make sure your staff are dressed in comfortable uniforms by choosing denim restaurant uniforms from Averill’s Sharper Uniforms. From aprons to chef’s coats, we have everything you need to give your crew the Canadian tuxedo treatment. Denim Server Two Pocket Full Bistro Apron – With a utility chest pocket, cell phone pocket, and contract tape ties, this apron is made for the server on the go. You’ll find that this apron is perfect for servers at a casual café or barbecue restaurant. Unisex Denim Roll-Up Restaurant Server Shirt – Both men and women will be comfortable on the restaurant floor and the back of the house with the roll-up restaurant server shirt. It is available as a long or short sleeved shirt. 100% Cotton Chambray Chef Coat with 10 Black Buttons – These chambray chef coats are created for comfort and functionality. They have a relaxed fit to make sure your chef doesn’t get too hot and great sleeve pockets for any cooking accessories! 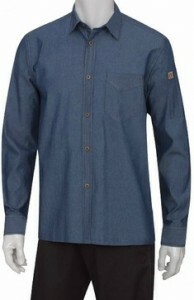 You can find spectacular denim restaurant uniforms, as well as many other wonderful options when you visit our website at SharperUniforms.com!